Derek Dooley desperately needed a win in Columbia today. Dooley came into today's game against South Carolina with a 0-14 record against ranked teams and facing a Gamecocks club that was coming off two bad losses in a row made them ripe for a upset, seemingly. The Volunteers came close, rallying from a pair of 14 point deficits to pull within three halfway through the fourth quarter but it was not to be as quarterback Tyler Bray, who had had a brilliant game, was picked off on a desperation throw with less than a minute left. And now it appears that Dooley is done in Knoxville. 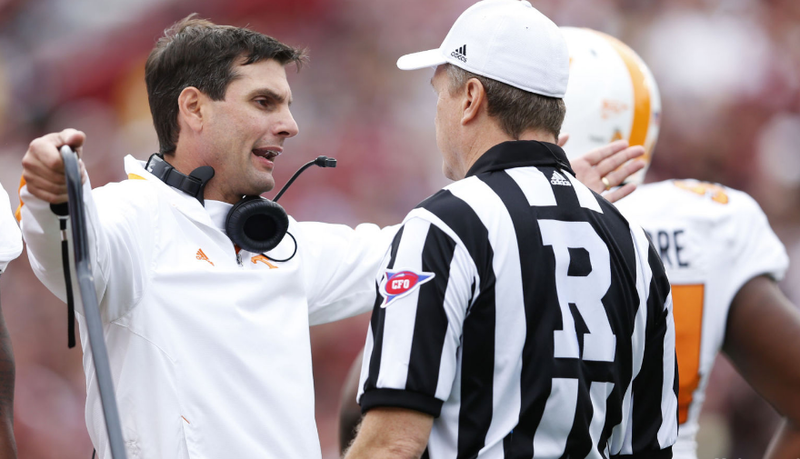 There is no question that Dooley walked into a tough situation when he took the Tennessee job. He was the third coach in three years at the program after Lane Kiffin bailed after one year to go back to USC and was seemingly a last ditch option after the program was unable to convince higher profile candidates to take the job, not even former offensive coordinator David Cutcliffe, who was coaching at Duke. Dooley had done a decent job at Louisiana Tech, had a pedigree of his father being legendary Georgia coach Vince Dooley and was from the Nick Saban coaching tree. In his first two years, Dooley had to deal with NCAA issues and a very young roster that ended last year not being bowl-elgible after an embarrasing loss to Kentucky, the first time the Vols lost to the Wildcats since 1984. But this was supposed to be the year that Tennessee was supposed to make moves forward. Dooley had his most talented roster, a good quarterback in Tyler Bray and the youngsters pressed into playing time now had the experience to get better on the football field. But alas, the Volunteers sit at 3-5 and now have lost 12 of their past 13 in conference and join Vanderbilt to be the only team in SEC history to be 0-5 in conference for three consecutive years. Dooley himself did not do any favors when he burned the team's final timeout late in the game when South Carolina quarterback Connor Shaw appeared to go out of bounds, stopping the clock anyways. The play was never reviewed and it left the Vols with having 35 seconds to go almost the length of the field to tie the game and they were not able to recover. Tennessee could still very well end up going to a bowl game with a favorable four game stretch to close out the season with home games against Troy, Missouri and Kentucky and a road trip to Nashville but scrapping for a bowl berth in the third year of the Dooley tenure is certainly not the expectations. Dooley needed a statement victory badly this year and his last chance was this afternoon in South Carolina. The only chance Dooley has to save his job is the realization that the athletics department at Tennessee is not exactly flush with cash and it could be tough to eat Dooley's $5 million buyout but the program has to stop the hemorrhaging and move on. And maybe, just maybe, they finally convince Jon Gruden to take the job.